ACDSee lets you organize, edit, and share your photos with ease. 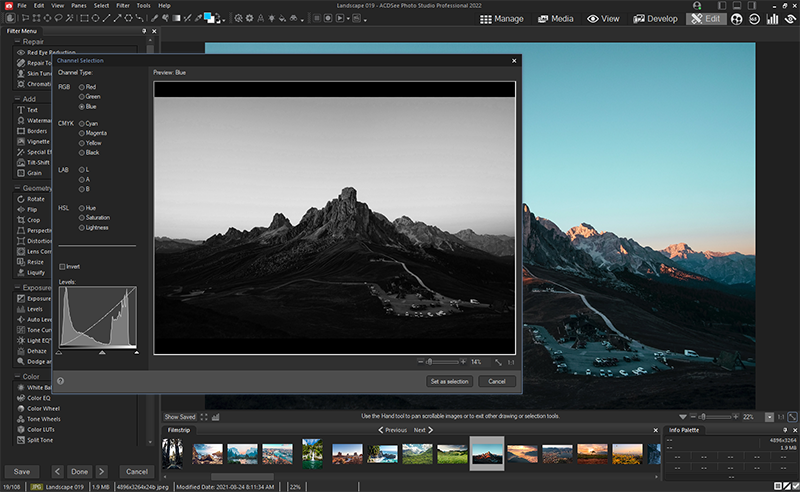 As the choice software for the practical amateur, ACDSee is trusted digital asset management paired with photo editing essentials. ACDSee is packed with efficiency-driven tools to help you organize your photos, tweak as needed, and inspire your friends, family and followers. Now featuring improved performance and stability, increased interface customizability to suit your process, more advanced noise reduction, and much more, ACDSee provides all of the fundamental elements you need for your productivity-motivated photography workflow. With a new mode dedicated to assessing yours stats on the fly, as well as settings to easily identify orphans amidst your library, ACDSee is the perfect solution for your growing photo collection. Do you need new and complete pgotograph editor ? Yes, you find it !.. First, I've used ACDSee Pro for years. Second, DxO Optics is my main processing program. Third, I don't like Lightroom though I have it and use it occasionally. ACDSee Pro is a great program. The best for browsing. Very good for processing though it lacks some of what DxO offers. ACDsee Pro is $120. DxO is $170 to $299. Lightroom 3 is $285 at Amazon today. ACDSee Pro is 61 MB. DxO is 105 MB. Lightroom is 162MB. The only reason to use DxO over ACDSee Pro is that DxO automatically corrects for my specific camera and lens combination. I haven't used ACDSee beta 4 enough to see if it has added that feature but it used to require manual correction. ACDSee pro is not bloated. It is a great piece of software. Always has been and still is. I process thousands of photos and use it regularly to catalogue, view and process raw files. I'd say you can't go wrong with this program. Getting more and more bloated and lumbered by an indexing system you can't turn off, even if you try to disable it by excluding all your folders. If you find it getting slower and slower - and you will - you have to delete the database, something you probably didn't want in the first place. Searching is an absolute abortion. Try searching for all the images within nested folders, then moving and renaming them. You'll give up before you figure it out. Used to be simple. They really have lost the plot with this once excellent program. Yes, ACDSee is bloated now. But it's still very strong and useful. Unfortunately, it's too pricey. I think ACD Systems is on the way to stagnation. Anyway, I rated its product as high as possible. I've been using this program off and on since 1995. I am simply FLOORED at how bloated it's become, and the price tag is ridiculous. Photoshop. tbresson: Acdsee 10 opens image as fast as version 3, and I believe Acdsee pro 2.0 uses the same core as Acdsee 10 too. BTW, who should people who wants a fast viewer rating the Pro version? It's not targetted to all the casual user who only wants a simple viewer anyway. They need to make the indexing and more of the obscure plugins and features optional. The browser itself is the fastest and most full-featured on the planet, yet the rest of the bloat makes it seem slow. I think that's the #1 complaint by users, it's too bloated! Look at all the comments, ACD, how long before you finally do something about it? Pros: "All in one" amazing photograph edit and RAW develop program !.. - Photo broser & it is reallt fast ! - RAW editor & much better than Adobe Photoshop Lightroom !.. Bottom Line: Do you need new and complete pgotograph editor ? Yes, you find it !.. tbresson - I couldn't agree more whole heartly. Fast Stone is a better alternative but can be a resource hog if you open it with folders that contain large amounts of pictures. After version 3, ACDSee only made this once great program worse. It's bloated, heavy on your PC and though it has many features, it's simply just too much if you just wanted to view some pictures. Back in the days, ACDSee was the best mainly because it loaded your pictures really fast. But if you have to wait for the program to start and tons of interface options it's not worth it. FastStone Imageviewer is really good replacement for people who use this, and it's free too. Well i can't speak for Beta. But ACDSee is a great program. It's all i've used for years. I've tried others but ACD has what I want. I got ACDSee Pro 1 and it works flawless. So I don't know why it's crashing for some people and not for others. Yes it is heavy program but it does a heck of alot also. If you don't like it fine. But I do. Acdsee, in my opinion has seen it's time and needs to retire. Acdsee has never been stable and seems to crash weekly. While it has some nice features like tif merge and built in picture editing, it also has a huge price tag. There are many free alternatives (some far superior)... Small footprint size and low resource usage are some critical things Acdsee never had. - Picasa for photos and Online-Offline Albums.